Funny, cruel, odd, personal … you get it all on Twitter. Each week, we’ll have a rundown of some of our favourite tweets. Here are the tweets for the week ending 18th March 2012. 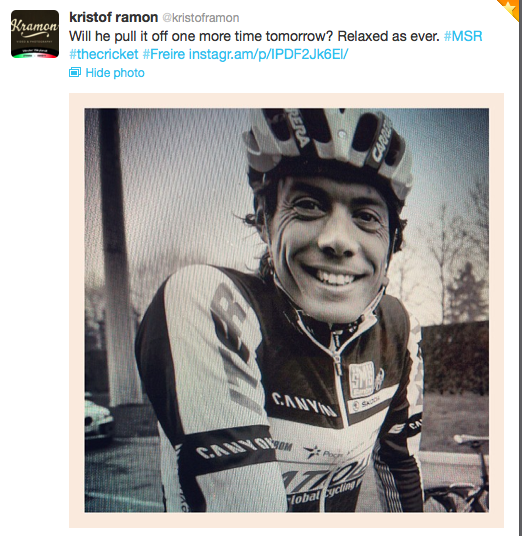 I featured Kristof Ramon‘s twitpics a few weeks ago and anyone on our Facebook page knows that I often share his pics there as well. And why not? Kristof takes some of the most expressive portraits of peloton people with his use of black-and-white and Instagrams just deepening the beauty. Here are few of my favourites from this week. I love this picture of Katusha‘s Oscar Freire on the eve of Milan-San Remo. He looks so joyous and relaxed.